Here is a recap of the weekend including the race. 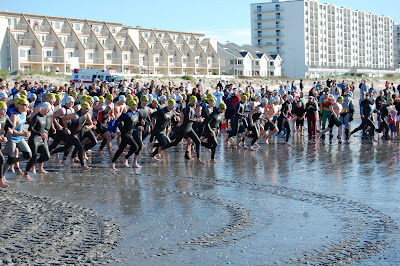 Arrive in sea isle around 5pm on Friday eve to pick up my race info. I got my bib and ship and as I was leaving they were asking people if they would wear the name of a fallen solider on their bib. I did not hesitate one minute. This was the young man to whom I was honoring. We then headed to Cape May. Went to bed around 11pm and was up at 4am. Time to race. I arrived in sea isle around 5am and parked at a Friends house. Only 2 blocks from transition which was nice. I got to transition around 5:45 am and setup my stuff. It was cold out still. I waited around until about 7am and got ready to race. Around 7:15am we headed to the beach to begin the race. I had my short sleeve wetsuit on and I knew I was going to be cold. Also my goggles were giving me trouble (time to get a new racing pair). At 7:30am the first wave was off and then we waiting 3 minutes and we were off. As we ran into the water I was instantly hit with a wave of 55 degree weather. Damm it was cold. I sucked it up and I began to swim my goggles at this point were fogging up and I was also getting water in them. It was hard to get into a rhythm because it was soo cold and also it was an ocean swim. I got through the swim in about 8 minutes and headed to T1. As I got my wetsuit off (the pam helped but I was so dizzy from the cold it did not matter) I dried off and headed out on the bike. The bike course was flat and fast there were some bumps (what do you expect it is a shore town) There was a head wind on the return loop which cut my speed down after the fist loop I was moving and making up some time. I completed my 3 loops and headed to T2. Once out of T2 it was on to the run. This was a beach run which made it very interesting. There was a storm the week before and it washed away all the sand around the pipes that drain into the ocean so not only was it a 5K it was also a steeple chase. I finished in 1:07:58 15th overall and 3rd in my age group. I was pleased with my result since I did no formal training and I just wanted to have fun. This was a great event for the first time and I look forward to going back next year. After the race headed back to cape may to enjoy the weekend. 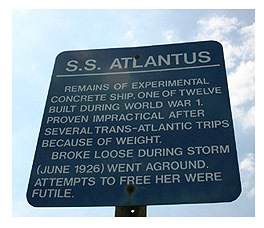 Went to Sunset Beach where a famous ship rests. That is all that is left. I have some pictures from the weekend. Great result-- you were a great competitor and we look forward to seeing you next year at Tri for Our Veterans II! Remember to have fun at your own wedding.